Once a private home, Lodge on the Desert features hacienda-style touches such as kiva fireplaces and Saltillo-tiled floors. It’s the a great jumping off point, with proximity to Tucson’s restaurants, shopping, opera, symphony, and the Museum of Art. For nature lovers and adventure seekers, the area offers gorgeous hiking, bird-watching, and caving opportunities. Rooms have the flavor of the Southwest, with partially tiled floors, exposed beams, ceiling fans, and snow-white linens on the beds. Some rooms have balconies with views of the Santa Catalina Mountains. The grounds are landscaped with indigenous cacti, palms, and flowers, and the lounge area by the pool has a fireplace and a hot tub. In-room spa treatments, offered by technicians from Tucson’s Elements in Balance Salon and Day Spa are just the thing after a day of shopping and hiking. Cielos serves a modern take on classic salmon and steak dishes. Floor-to-ceiling windows overlook an intimate, authentic Southwest patio. For drinks and nibbles, try a Prickly Pear Mojito and the charcuterie plate in the bar. The Randolph North Golf Course was designed by architect William P. Bell in 1933. It's an eighteen-hole championship course less than a mile from the Lodge. The Lodge on the Desert is located in mid-town Tucson, twenty minutes from Tucson International Airport and less than ten minutes from The University of Arizona. Shopping, golf, and cultural attractions are even closer. Cancel 72 hours prior to arrival or a one night room and tax will be charged. Lodge on the Desert makes meeting and event planning easy for planners of any type of event. 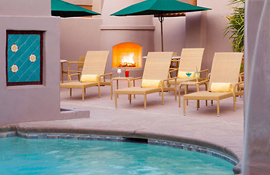 The midtown Tucson location boasts 100 guestrooms and suites in a unique and charming setting for small to mid-size business meetings and social events. Their location is convenient and accessible from anywhere in Tucson. For banquets or catering of any sort, let Lodge on the Desert staff help facilitate a memorable event.